Monica Rosquillas teaches for an environmental nonprofit. Bena Leslie does business marketing, and Steven Borelli hawks apples for a living. The three have totally different jobs, but that’s not apparent to the naked eye. “There are lawyers or accountants or developers, so there's a wide range of professions here," Rosquillas said. These workers don't rent a traditional office. 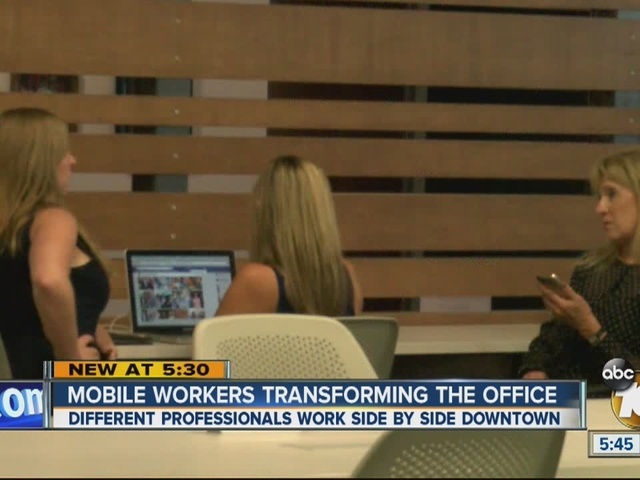 Instead, they either pay by the hour or by the month for a spot to open their laptop at Co-Merge in downtown. It's an ultra modern, open workspace that's a bit more formal than a coffee shop, but more collaborative than the traditional office. Co-Merge is part of what analysts say is a small but growing segment of the commercial real estate market. It caters to small companies or self-employed young professionals that don't want to spend on office space and equipment. "Today many more people are freelancing or working on projects and there's an expectation that they will do a really great job for the company that they're working for, but that they're not going to be there forever,” said Michael Kenny, a Co-Merge partner. But when they are at Co-Merge, they also leave room for a little fun around the office. "Every Friday there’s a keg here and so we’ll grab beers and kick it and a lot of my friends now work here,” Borelli said. Members have the option of paying a $120 initiation fee and then lower hourly rates. Co-Merge opened in 2011, but is currently trying to expand to other parts of the county.